Now, I do not state my support for this new water technology, but Air-Water Corp – a Florida-based outfit – claims to have created a machine that will effectively extract humidity from the air to produce 25 to 5,000 liters of water each day, if the conditions are right. These machines need high humidity (above 55 percent) and high temperatures (above 65 degrees) to operate. Air-Water Corp just delivered their first village-based unit to Jalimudi in Andhra Pradesh, India. The unit cost Rs. 3 lakh, that is 6,156 US dollars. It is unclear how much electricity this machine needs to operate, but it might be able to produce up to 1,000 liters of water each day. Really, the concept is nothing entirely new because people have known how to take water from the air for centuries. Rainwater harvesting is used in areas with limited surface water or ground water sources. More recently, people have started to use fog nets to collect condensed water from the air. Some fog nets are able to collect up to 200 liters of water each day. So, is it worth it to buy a machine for 6,000 US dollars that uses an unknown amount of electricity to create water from the air? We will have to wait and ask Jalimudi village a year from now. But, one thing is for sure, the fact that Air-Water Corp is pursuing a 2 million dollar lawsuit against a sub-contractor that built these units for “repeated deliveries of faulty and sub-standard machines to Air Water’s customers” is a bit scary. I’m not sure if you noticed, but water journalism is becoming the next big thing. And, you know, this is really great because it will encourage more people to pay attention to world water supplies, conserve water, work on water availability technology, and, generally, just become more aware about global water issues. The University of Miami – School of Communication is interested in global water, too. They recently collaborated on a project called One Water. This website features a movie about global water supplies called One Water, youth curriculum about global water issues called KNOWATER, and a weppage for water journalism called 1H20.org. Singapore is hosting International Water Week from June 23rd to June 27th of 2008. This first-annual event is to be held as a forum for “government officials, industry leaders and water specialists” to discuss policy, business, and water technology. Festivities of the week encompass a Water Trade Show, a Water Summit, and presentation of the Lee Kuan Yew Water Prize to an innovator in the field of water technology. In 2006, Singapore began wide-spread governmental investments in water technologies to accelerate economic growth in the water sector. No doubt hosting two-hundred exhibitors of water technologies will be great way for the country to stay abreast of additional investment opportunities. Black and Veatch, a company that aims to increase dam and reservoir construction in response to increasing water scarcity. The Dow Chemical Company, with a track record of dioxin contamination of waterways. French owned companies, SUEZ and Veolia Environment, both engaged in water privatization in developing countries (not known for great customer service or reliable water infrastructure). Enterprising steps in the field of water technology are fundamental to ensure available water supplies now and into the future. Does sponsorship of International Water Week by the above organizations make this event any less important? Not necessarily, but maybe it does mean that we should pay closer attention to these companies and their water management standards. If you pay attention to international water issues, you will soon realize the small country of Israel is slowly attempting to make a name for itself in the field of water technology. In fact, Israel recently hosted an international water technology conference, WATEC, from October 30 to November 1 of 2007. Israel, though lacking in natural water resources, is exporting its water technology across the globe, billing itself as the “Silicon Valley of water technology,” in the words of Infrastructures Minister Binyamin Ben Eliezer. Israel hopes to increase export revenues from water technologies to 2 billion US dollars by 2010. The Israeli government has just launched a program to maximize technical knowledge of desalination, water purification, irrigation systems, water treatment, reclaimed water, water security, and water infrastructure. Given the increase in global water scarcity, Israel is one of many entities ready to step into an open-economic playing field to double their dollar in the field of water technologies. The expenditures for municipal water and wastewater applications were $8,066 million in 2005, $9,575 million in 2006, and $11,290 million in 2007. They are expected to grow at compound annual growth rate (CAGR) of 22.2% and reach $39,709 million by 2012. We can apply the economic model of supply and demand very clearly to the water scenario. 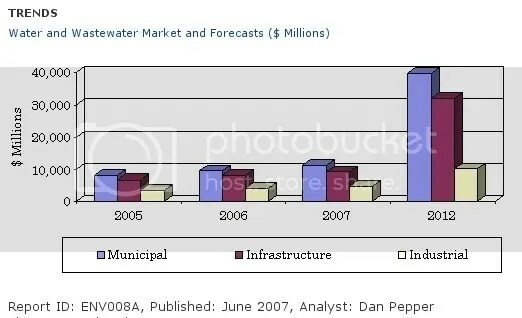 As demand for water increases, the price of water (water technologies, etc.) on the world market will also increase. Consequently, there will be an accrual of entities hoping to profit on the commodity of water, alas we are seeing such happening presently. Author’s Postscript: This post highlights global water technology markets and Israel’s current standing in such world markets. However, there are many critical water issues relating to Israels continued occupation of Palestinian territories in areas of the region with greater access to water. Additionally, Israel maintains water technology, yet continuously fails to supply Palestinians with assistance for development of water infrastructure or access to reliable water supplies. In the near future, I will attempt to address these issues. Kids twirl around on a Merry Go-Round while water is pumped into a large reservoir holding tank. The PlayPump, under PlayPump International, is not cheap by any means at 14,000 dollars for one system, but is supposed to be more efficient and fun than a traditional hand-pump. Currently, there are over 700 installed and plans to install 4,000 more in rural locations in arid Africa by 2010. Check out this blog post on Alcateia Design Group News for an interesting view on the system.